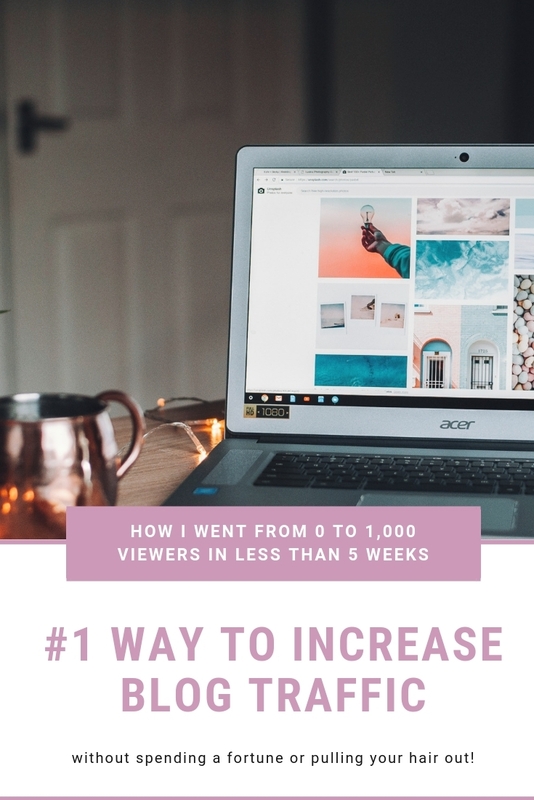 How I went from 0 to 1,000 monthly visitors in less than 5 weeks on autopilot! Are you ready to increase your blog traffic practically overnight? You need two things to get started: Pinterest and Tailwind! I’m going to tell you exactly what I do here, and then I’ll break it down for those of you who are totally new to the Pinterest game! Pinterest is awesome because it’s free to use, it’s easy to spread amazing pins and watch your pin go from 0 to 100s of impressions in a matter of hours. It’s also a fun way to connect with other bloggers and build your online community. Tailwind is an automated pinning app. There are others, like Boardbooster, but I started out with Tailwind and absolutely fell in love… so I never felt the need to try anything else. There is a paid version of Tailwind, and you’re limited in how many pins you can share via Tailwind on the free version- but I was able to see massive results from the free version alone before I decided to pay for the full version. I pin 30-50 pins per day without lifting a finger- by scheduling them using Tailwind. I set aside about 4 hours each month to schedule pins (usually I do this all in one afternoon, and then I’m good to go for a month!). The timing for this is even less if your pins are already created! It takes me about 4 hours because I sit down to create the pins I want to share (usually 8-12 new pins) and schedule them to all of the relevant boards, spend time scheduling content from the group boards I’m a part of to help support the awesome bossbabes I am in groups with, and spend some time sharing pins from the Tailwind tribes I’m a part of, all in one sitting. You can break this down into several sessions or make your pins ahead of time if you like shorter work-flows! It’s actually a super inspiring and fun time of the month- and I leave with a good handful of articles to read throughout the week to keep building online connections and growing my own blog and business! If some of that was like Greek to you, don’t worry! I’ll break it all down. Here’s everything you need to know about Pinterest as a blogger! It’s the freakin’ bees’ knees. Seriously. It really helps SEO-ify your bio. Pinterest isn’t the place for cute word play, it’s a search enginge and you want to be easy to find! You want to have at least 3 boards, and at least 5-10 pins on each board! That way, when people do find you on Pinterest, there’s enough there to entice them to follow you and help spread your awesome content around! Again, think about it like a search engine. You want your board titles to be key words that clearly explain what the board is about so that people can actually find you! Group boards are awesome. You can find group boards by searching ‘______ group board’ on Pinterest, and you can tell it’s a group board because in the bottom corner of the board, there will be a circle split into 2-4 profile images. Those are some of the group members! Most group boards have instructions for how to join in the description. You can see examples of group boards on my profile, one of my favorites is the Journey to a Life You Love group board. Group boards were KEY to increasing my Pinterest impact and increasing blog traffic quickly. Some bloggers share lists of group boards, you can search for those pins in Pinterest and check out the lists to find out which group boards are in your niche! Here are some Pinterest Profiles to Inspire you! Note the way each bio and board title increases the ease with which these awesome ladies can be found on Pinterest! In Alessandra Braun’s Pintraction Course, I learned that 25-50 pins per day is the sweet spot you want to hit to optimize your Pinterest impact! That might sound like a lot, but it’s not so much when you really think about it, because you’re pinning the same pin to different boards sometimes. For example, I pin ALL of the pins I create to the board I created exclusively for my own pins. I also pin them to each relevant board, and since most of my boards are centered around empowering people, my pins are usually relevant to at least 5 of my boards! And, of course, I want to share every pin I make to the group boards I’m a part of. I’m currently a part of 4 group boards… so if I create 1 pin that is relevant to five of my boards and all 4 of my group boards, that ends up actually being 10 pins! AND Tailwind has this awesome function where you can schedule your pin to multiple boards at once and then set it to post at a set interval, so that you aren’t pinning that same pin 10 times in a row, instead you can tell it to post them hours, days, weeks, or months apart! I do this same thing when it comes to pinning FROM the group boards I’m a part of. Sometimes the same pin will be relevant to several of my boards, so I’ll schedule it to post to a few boards, and I’ll set that interval so it doesn’t spam my followers! It’ll come up at different times and help that pin reach a different audience. Win win! Tailwind has one other feature I want to tell you about today. One more thing you can do to boost your visibility and increase your blog traffic is participate in Tailwind Tribes! These are essentially the Tailwind equivalent of Pinterest Group Boards. There’s a set number of tribes you can be a part of and a set number of pins you can share with tribes each month, but it’s a really great tool and it’s yet another fun way to connect with other bloggers! I like to check out my Pinterest analytics (you can access this when you upgrade to a free business account) to find out which of my pins are doing best, and then I share those ones to Tailwind Tribes. I’ve noticed that has a bigger impact on how far the pin goes because my Tailwind Tribes look for high quality content. I hope these tools will help you to increase your blog traffic and grow your online community! It’s been so much fun learning how to reach more people in the online space and I’m having a blast getting to know my fellow bloggers. If you’ve used these tips in the past or have more to add, let me know in the comments below. I’d love to hear from you! P.S.S. Are you building your own business? Check out the free resource library in the Independent BizBabes Inner Circle! Subscribe below for free access! Sign up with your email address to receive free resources and access to the Independent BizBabe resource library! Thank you! Now go confirm your email address and check your email for goodies! !